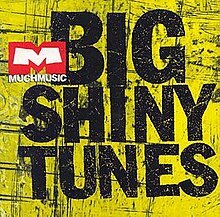 Big Shiny Tunes is a series of rock albums compiled and released by the Canadian music television station MuchMusic, and through MusiquePlus in Quebec, beginning in 1996. The best-selling album of the series was Big Shiny Tunes 2, which was certified Diamond in Canada (1,000,000 units) by the CRIA on March 25, 1998. It has been cited as the best-selling album series in Canadian history, with 5 million albums sold in ten years. Part of the appeal of the series is that those who do not usually buy albums will find Big Shiny Tunes provides several well-known songs, as opposed to a CD by a single artist whose non-single tracks may be relatively unfamiliar. The music is aimed at teenagers and young adults. There has been some criticism of consistency in regards to the use of censored versus uncensored versions of songs from album to album (Big Shiny Tunes 6 carried a label stating that some songs contained coarse language, while the previous and following albums had censored songs by Matthew Good, Limp Bizkit, Staind, Not By Choice and Wheatus). In addition to the ordinary albums in the series, MuchMusic also released albums that compile the biggest hits across a span of years, such as Big Shiny 80s (2005) that included classics like Billy Idol's "White Wedding." There have also been two volumes of Big Shiny 90s released. The album Big Shiny Tunes was released in 1996. A new edition was released every year after until 2009, with Big Shiny Tunes 2 being particularly successful (the second and third albums alone account for over 2,000,000 of the albums sold under the brand). Big Shiny Tunes 2 had been accompanied by heavy advertising. The next year, MuchMusic assembled Big Shiny Tunes 3 by having its audience vote on which songs they would like to have included, a novel process. The success of the series continued as Big Shiny Tunes 6 sold 68,500 copies in its first week in 2001, more than any other album in Canada that week. However, the series soon lost its predominance with the growth in popularity of rap music, as the next year Big Shiny Tunes 7 was outsold in its first week in Canada by Eminem's soundtrack to the film 8 Mile. Still, Big Shiny Tunes 7 sold 25,100 copies that week. Big Shiny Tunes 8, released in 2003, also made the best-seller list in Canada. The last album in the series, Big Shiny Tunes 14, was released on October 20, 2009. As of 2010, the series is on an indefinite hiatus. Note: Was certified 3x Platinum (300,000 units) in Canada on April 24, 1997. Note: Best-selling album of the series. Was certified Diamond in Canada (1,000,000 units) on March 25, 1998. Note: Was certified 8x Platinum in Canada (800,000 units) on February 19, 1999. Note: Was certified 8x Platinum in Canada (800,000 units) on November 6, 2000. Note: Was certified 6x Platinum (600,000 units) in Canada on December 6, 2001. Note: Sold 68,500 copies in its first week. However, it has not been certified by the CRIA. Note: Was certified 3x Platinum (300,000 units) in Canada on September 17, 2009. Note: Was certified 2x Platinum (200,000 units) in Canada on January 22, 2004. Note: Was certified Platinum in Canada (100,000 units) on March 22, 2005. Notes: When the track listing was originally shown via online music stores such as Mymusic before the official site opened, songs by Green Day, Audioslave, System of a Down, Arcade Fire, Beck, and the Foo Fighters were shown to be on the album. Notes: The album's official site also lists "Stricken" by Disturbed as being on the album as well, but it doesn't appear in the final product. The album was certified Platinum in Canada (100,000 units) on February 1, 2007. Note: Was certified Gold in Canada (50,000 units) on July 30, 2008. Note: Was certified 2x Platinum (200,000 units) in Canada in February 2004. ^ a b c Tom Harrison, "Big Shiny Tunes finds big niche: Compilation albums reflect modern rock and sell millions in Canada," The Province, Vancouver, B.C. : January 13, 2002, pg. B.5. ^ Chapters, "Big Shiny Tunes 10," URL accessed February 17, 2006. ^ CNW Group, "MuchMusic Celebrates 10 Years of 'Big Shiny Tunes'," November 10, 2005, URL accessed February 17, 2006. ^ Ivan Danielewicz, "Spun," Gauntlet Publications Society, University of Calgary, February 05, 2004, URL accessed February 17, 2006. ^ Raymond J. Arsenault, "Big Shiny Tunes really shining," Journal- Pioneer, Summerside, Prince Edward Island: November 27, 1999, pg. A.7. ^ "Daily Music News". Chart. 1999-11-17. Archived from the original on 2008-03-23. Retrieved 2009-10-10. ^ Chris Dafoe, "New Recordings pop Big Shiny tunes 2," The Globe and Mail, Toronto, Ontario: January 22, 1998, pg. C.5. ^ Sheri Block, "CD Reviews Archived 2007-12-19 at the Wayback Machine," The Carillon, January 1999, volume 41, no. 17, University of Regina, URL accessed February 24, 2006. ^ a b c John Williams, "Eminem polishes off 'Shiny Tunes'," Canoe.ca, URL accessed February 17, 2006. ^ John Williams, "New Furtado stumbles on chart," Canoe.ca, URL accessed February 17, 2006. For "Big Shiny Tunes" "Top Albums/CDs – Volume 64, No. 19, January 13, 1997". RPM. Retrieved 2010-10-04. For "Big Shiny Tunes 2" "Top Albums/CDs – Volume 66, No. 15, December 15, 1997". RPM. Retrieved 2010-10-04. For "Big Shiny Tunes 3" "Top Albums/CDs – Volume 68, No. 12, December 14, 1998". RPM. Retrieved 2010-10-04. For "Big Shiny Tunes 4" "Top Albums/CDs – Volume 70, No. 8, December 13, 1999". RPM. Retrieved 2010-10-04. For "Big Shiny Tunes 5" "Canadian Albums – Week of January 13, 2001". Billboard. January 13, 2001. Archived from the original on 4 October 2010. Retrieved 2010-10-04. For "Big Shiny Tunes 6" "Canadian Albums – Week of December 01, 2001". Billboard. December 1, 2001. Archived from the original on 4 October 2010. Retrieved 2010-10-04. For "Big Shiny Tunes 7" "Canadian Albums – Week of November 30, 2002". Billboard. November 30, 2002. Archived from the original on 4 October 2010. Retrieved 2010-10-04. For "Big Shiny 90's" "Canadian Albums – Week of February 08, 2003". Billboard. February 8, 2003. Archived from the original on 4 October 2010. Retrieved 2010-10-04. For "Big Shiny Tunes 8" "Canadian Albums – Week of January 10, 2004". Billboard. January 10, 2004. Archived from the original on 4 October 2010. Retrieved 2010-10-04. For "Big Shiny Tunes 9" "Canadian Albums – Week of November 27, 2004". Billboard. November 27, 2004. Archived from the original on 4 October 2010. Retrieved 2010-10-04. For "Big Shiny Tunes 10" "Canadian Albums – Week of December 10, 2005". Billboard. December 10, 2005. Archived from the original on 4 October 2010. Retrieved 2010-10-04. For "Big Shiny Tunes 11" "Canadian Albums – Week of November 25, 2006". Billboard. November 25, 2006. Archived from the original on 4 October 2010. Retrieved 2010-10-04. For "Big Shiny Tunes 12"
For "Big Shiny Tunes 13" Williams, John (November 5, 2008). "AC/DC's sales slip, still No. 1". JAM!. Retrieved 2010-10-04. ^ Gold & Platinum Certification – February 2007.